iCam allows you to stream live video and audio from up to four webcams to your iPhone or iPod touch over WiFi, 3G, or EDGE. iCam 2.0 has been submitted to Apple and will hopefully be approved soon! 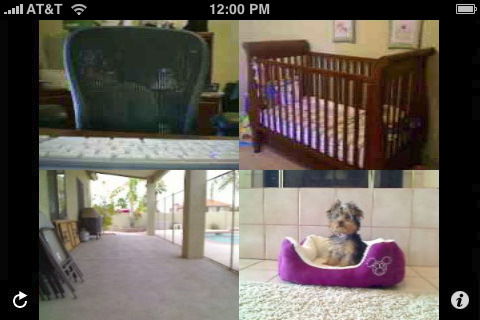 Popular uses include baby monitor, pet cam, nanny cam, spy cam, and security camera. Record and playback Motion Events and Receive Push Notifications on your iPhone when Motion is Detected by your iCamSource(s) – Visit http://skjm.com/icam/vid.php for video demonstrations. The iCamSource software supports Windows XP/Vista/7 and Mac OS X 10.4 and later. NOTICE: If you are ever having issues please contact support instead of just leaving a bad review as we have no way of contacting you to help resolve your problem. Thanks! Q : What do I need to do to setup and use iCam and iCamSource? 1) Download iCam to your iPhone or iPod touch and iCamSource to your computer. 2) Start the iCamSource, and choose your USB / FireWire / Built-In webcam from the Video and Audio drop-down lists. If you are connecting to an Ethernet / Wi-Fi camera, simply enter the camera’s MJPEG/JPEG URL along with the camera’s login and password. 3) Enter a Login and Password, and click the Start button. iCamSource is now setup and running. 4) Start iCam on your iPhone or iPod touch, and enter the same Login and Password from Step 3. 5) Tap Done. iCam is now setup and running, and should connect to the iCamSource running on your computer. Tap a video thumbnail to Zoom In, and Double-Tap to Zoom Out. Repeat Steps 2 & 3 for any additional computers and Steps 4 & 5 for any additional iPhones or iPod touches, being sure to use the same Login and Password for all of them. Q : Do I have to configure my firewall or router or know what my IP address is to use iCam? In most situations, things should “just work” unless your network is particularly complex or restricted. If you do have problems getting things to work, please be sure to either Contact Support or visit the Discussion Forum. Q : Does this work if iCam is connected via EDGE or 3G or a different WiFi network than the iCamSource? Q : What types of cameras does the iCamSource support? A : The iCamSource currently supports any Built-In, FireWire or USB webcam supported by Windows XP/Vista or OS X 10.4 (Tiger) and later. It also supports FireWire-connected DV cameras on OS X 10.5 (Leopard) and later. Video-only support is also available for most MJPEG/JPEG-compatible WiFi and Ethernet network IP webcams. MPEG-4 and h.264 devices are not supported. Q : Can I save screenshots in iCam? A : Yes, you can save screenshots by pressing the iPhone’s Home and Sleep/wake buttons at the same time. The images will be stored in your iPhone’s Photos Camera Roll. Q : Is iCam “peer-to-peer” or are the audio & video sent through your servers? A : Yes, iCam is a “peer-to-peer” application. The iCamSource sends its audio & video directly to iCam, and nothing is ever sent through our servers. Q : Can anyone else connect to my iCamSource and view my webcam? A : No. The only way that someone can connect to your iCamSource is if they know your iCam Login and Password, just like every other account you have on the Internet. In addition, your iCam Login and Password are never sent to our servers, so your video feeds are able to be kept completely private.